Please do not approach damaged oil field production equipment or tanks. Many oil and gas facilities were damaged during the recent floods. 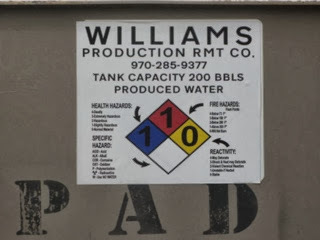 Tanks and other equipment associated with oil and gas facilities may be PRESSURIZED and may contain FLAMMABLE LIQUIDS. These tanks and other equipment may be unstable and could shift, fall, or roll suddenly. 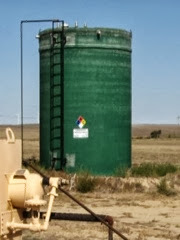 If you see suspected oil field tanks or other equipment that has moved from an oil or gas location, please contact the Colorado Oil and Gas Conservation Commission (COGCC) at 303-894-2100 to report the location of equipment and tanks that appear to be damaged, and are not in the process of being repaired or replaced by the Operators. You can also use the email notification system available on the COGCC website at www.cogcc.state.co.us. Please note any identifying information on the tank to provide to COGCC. Please note that 55-gallon drums are generally NOT related to oil and gas operations. Tanks related to oil and gas operations typically hold between 200 and 400 barrels, or about 8,500 to 17,000 gallons. Stray 55-gallon drums should be reported to local law enforcement or public health officials. In general, oil and gas equipment will have the following kinds of identifying information: Operator Name, Emergency Contact Number, Tank Capacity, Tank Content, NFPA Hazard Diamond. 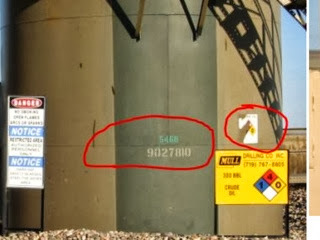 Additional Markings: Tanks may be marked Township, Range, and Section (for example - 5N65w). tanks will also have information related to crude oil transportation/ gatherer: For example the name of the gatherer could be SymCrude, Plains Petroleum, or a tank identification number used by the transportation/ gatherer.